CheckdMedia's social marketers took on the challenge to establish Football Index as an innovative new concept within the gambling industry. To establish Football Index as an innovative new concept within the gambling industry. CheckdMedia’s multiple sports brands instantly put us in a strong position to distribute Football Index content to the millions of football fanatics. Our social marketers implemented a content plan tailored to Football Index, where delivery of content was managed efficiently, and interest was driven through engagement around Football Index. Social posts were consistently posted throughout the campaign across all brands, as well as page sponsorship on websites, on-site ads, blogs, push messages and video created by our in-house content team. 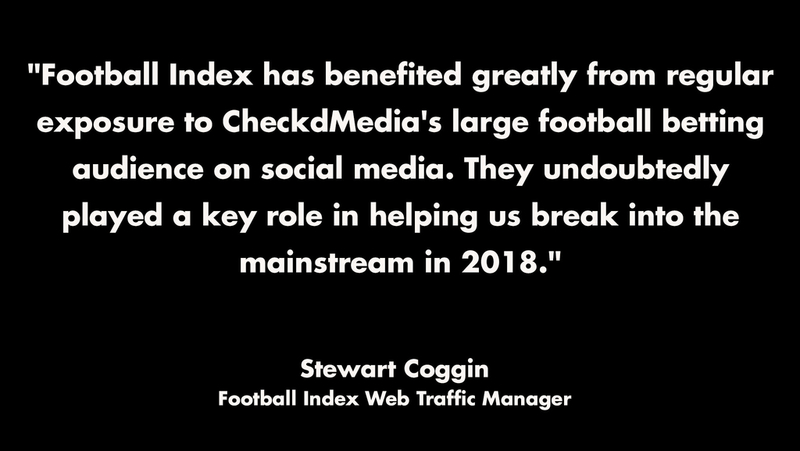 CheckdMedia continue to help Football Index, over a number of campaigns to increase popularity, understanding of the concept and database size.